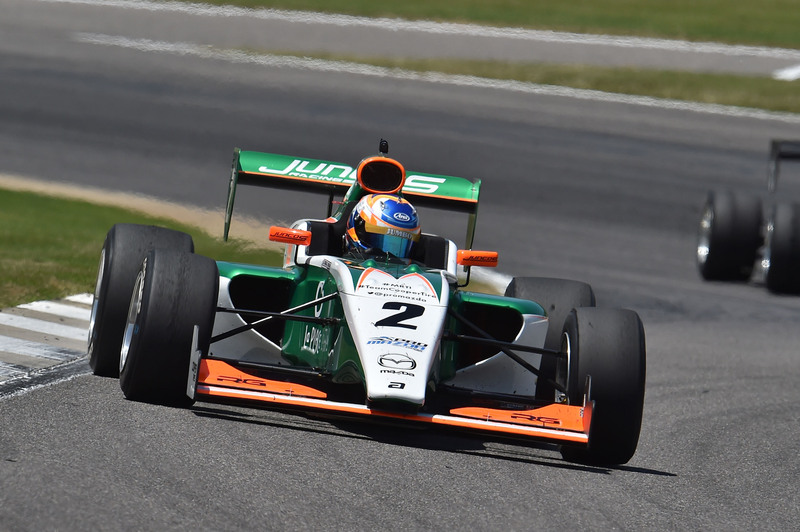 KNAF Talent First car racing talent Rinus VeeKay scored valuable points in round two of the Pro Mazda Championship Presented by Cooper Tires. In treacherous conditions at a damp Barber Motorsport Park the 17-year-old driver from Hoofddorp in the Netherlands claimed the fourth position with some great overtaking maneuvers after starting the second race of the weekend from ninth on the grid. In the first race the Juncos Racing driver finished in fifth position and that was the best possible result in the situation he had to deal with. “Although it was not our best weekend, the races were good and I’m happy with the championship points,” said VeeKay. The beautiful but difficult track of Barber Motorsports Park was host to round two of the Pro Mazda Championship Presented by Cooper Tires. After claiming a double victory in his debut in St. Petersburg, KNAF Talent First car racing talent Rinus VeeKay was the leader of the championship and also ‘the man to beat’ in this Mazda Road to Indy category. Barber Motorsports Park is a track where you must have the right flow to be quick. VeeKay and his team Juncos Racing were struggling with the set-up of the car in qualifying and the 17-year-old driver from Hoofddorp in the Netherlands couldn’t manage better than seventh and ninth, also his starting positions for the two races. VeeKay had a good start in the first race of the weekend and with two great overtaking manoevres the young Dutchman gained two positions and was fifth after the first lap. An attack to gain the fourth position after the restart from behind the safety car was not successful and so VeeKay remained fifth. Barber Motorsports Park is a track where you lose almost all your downforce when you drive in the slipstream of the car in front of you, so VeeKay had to keep some distance to the car in fourth position. VeeKay dropped back a bit, but after a few laps the KTF driver closed the gap to the drivers fighting for third and fourth position. But to get close enough to be in a position to overtake those two drivers was not possible, and so VeeKay finished in fifth position, less than a second short of the number four position. The Juncos Racing driver scored the third quickest lap time of the race, proving that the speed ‘in free air’ was good. “This was the max I could do. You lose so much grip when you drive close behind the car in front of you, that it’s almost impossible to overtake,” said VeeKay. Starting from ninth on the grid, there was an even more difficult task to do in race number two. But VeeKay got some help from the changing weather conditions. While all cars were on slick tires, some spots of rain began to fall short before the start of the race. With driving different wet track lines and some great overtaking maneuvers, the young Dutchman gained three positions and was sixth after three laps. Although VeeKay was much faster than the drivers in fourth and fifth position, it was impossible to overtake them. While the track was getting wetter, the top six were still within 2.8 seconds of each other after fourteen laps. On the 20th lap VeeKay made a successful move into fifth position and was immediately promoted to fourth when one of the drivers in front of him made a mistake and went into the gravel. That was the moment for the race officials to deploy the safety car for the remaining five laps, but also for VeeKay the sign he couldn’t make up some more positions. But starting from ninth, the Juncos Racing driver was happy to finish in fourth position. VeeKay scored the second quickest lap time of the race and was awarded with the Tilton Hard Charger Award for coming back from ninth position and his great overtaking. After two rounds of the Pro Mazda Championship Presented by Cooper Tires the KTF driver is in second position, four points short of the leader. “Our set-up was not 100% this weekend and so we lacked some speed, and that on a track where it is so hard to overtake. The races were good and that’s why, although it was not our best weekend, I can still be happy, especially with the valuable points we scored for the championship. It was a pity we had to drive the last five laps behind the safety car, otherwise a podium would have been possible. The track was not so very wet,” said VeeKay after his second race weekend in Pro Mazda.